Start 2016 with Polar Bear Plunges and a dip, Jan. 1; First Day Hikes, Jan. 1; Washington State Park Winter Recreation and overnight reservations; winter recreation at Mount Rainier National Park, through March; Washington Park Arboretum walks and Tram Tours, Seattle. Happy new year! Sunny, chilly weather is in the forecast for the weekend, perfect for getting outside. If resolutions for good health are on your agenda, fresh air and outdoor activities are a great way to start. 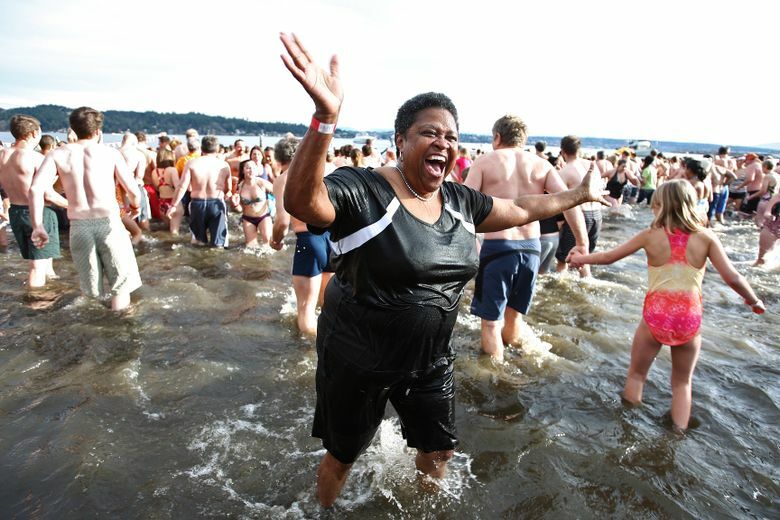 Kicking off the year with an audacious outdoors dip is popular at organized events like Seattle’s Polar Bear Plunge and similar events in Renton, Kirkland and Tacoma on Friday, Jan. 1, and informally at many beach and lakefront locations. Washington State Parks hosts First Day Hikes at 25 parks around the state Friday, Jan. 1, including Dash Point State Park in Federal Way, Flaming Geyser State Park in Auburn, Saltwater State Park in Des Moines, and many more on Camano Island, Hood Canal, Whidbey Island, along the coast and in Eastern Washington. Friday is also a State Parks Free Day so the usual Discover Pass is not required for visits at all state parks. Two more free days to enjoy state parks are coming up soon, Jan. 17 and 18, in celebration of Martin Luther King Jr. Day. Washington State Parks’ ongoing Winter Recreation Program provides opportunities for cross-country and downhill skiing, snowmobiling, dog sledding, snowshoeing and tubing at a variety of locations in seven national forests and other lands around the state. The program manages Sno-Park cleared parking areas near groomed and backcountry trails, some open to both motorized and nonmotorized recreation and some only for nonmotorized snow play and activities. Sno-Park daily or seasonal permits are required; a few locations also require a daily or annual Discover Pass. For Washington State Park overnight stays, reservations for campsites, yurts, cabins and vacation houses are available up to nine months before your arrival date, so it’s not too early to be making summer-vacation plans, especially for popular locations. Winter recreation at Mount Rainier National Park features ranger-guided, 1.8-mile snowshoe walks on Saturdays and Sundays, conditions permitting. National Park Inn and General Store and Longmire Museum are open daily with lodging, dining, park information, snowshoe and cross-country ski rental. Weather and road conditions vary and can change quickly; always call or check the park’s website for current conditions and possible closures before heading out. All vehicles are required to carry tire chains in the park, and the Longmire to Paradise Road is sometimes closed when the park is open. For outdoor beauty without leaving town, Washington Park Arboretum hosts Sunday walks with a focus this month on park conifers. The Arboretum has recently acquired a 13-passenger, open-air electric vehicle for tours for visitors with limited mobility and others, available for free rides by reservation on First Thursdays, Jan. 7, Feb. 4 and March 3.